If you are looking for a long lasting, high quality industrial washdown or fire attack hose at a reasonable price, our NL9775 is the product for you. It is a hi-visibility, low-temp (-60°F), double jacket fabric hose commonly used in construction, industrial, municipal fire fighting, and high-rise backpack applications. Its cover has a special treatment for added resistance to absorption, abrasion, mildew, rot, heat, and chemicals. 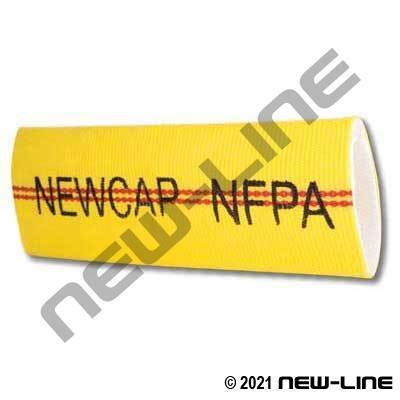 This treatment sets NL9775 apart from other more economical double jacket fire hoses and makes it suitable in more aggressive washdown or fire attack applications. Also, its truly unique urethane tube provides high flow rates with low friction loss and provides much better resistance to punctures, mildew, petroleums, solvents, and aging as compared to conventional rubber fire hoses - and it is only a fraction of the weight and is much more compact. Meets or exceeds NFPA 1961/62, refer to local fire code standards for fire attack hose regulations. Unlike some urethane lined hoses this is not to be used for potable water applications, please refer to our NL5080 blue potable water transfer. Popular assemblies are listed below, if forestry couplings are desired then simply thread in standard N9505/N9510 adapters to the NPSH threaded expansion ends attached to the hose. Typical Fittings: N9701/9702 hardcoat aluminum expansion couplings (N9721 forestry ends are typically for light duty, low pressure, and less critical service and are therefore not used on this hose). When used for municipal fire fighting, this hose must be tested according to NFPA Standards. Construction: Tube: Urethane elastomer. Jacket: Hi-visibility yellow, double jacket, circular woven, all virgin spun polyester with a special treatment to resist moisture, abrasion, mildew, and rot.